Good Morning, Friends. I'm so glad you stopped by! Today, I was compelled to share with you a new project, as well as, a look back at some old favorites, to prove that, in fact, Anything can be made into a Beautiful, Elegant Centerpiece! And still be done on a Shoestring budget (under $5, or less, actually). This beautiful piece, for example, was a little magazine holder I picked up at a rummage sale last month for $1 Yes, that’s what I said $1. It’s wasn't very old or even very pretty. But, it had at the top of it that wonderful Metal lace!! In my mind, I could see it in a beautiful Antique white. There was a small crack in one leg, easy fix, just a little crazy glue. And then, it occurred to me that I still had over a half of can of that wonderful Antique white spray paint I had used for my Rod Iron Candle Redo!! Perfect! Now was just the simple problem of how to make this container a vessel for beautiful blooms. 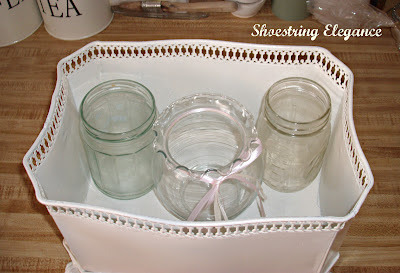 With the sides at 6 inches, how simple to put some good old mason jars and an odd vase here or there, that could be filled with water and easily replaced as necessary!! This is when I could start to see the end image in my head!! So exciting to transform someone’s cast off’s into a beautiful repurposed, showcasing piece!! I am the very first to tell you, that I am not extremely “crafty” so-to-speak. But, I have found that if you look at the shape, dimensions, features, or “bones” of an object, You can truly see an inner beauty in it waiting to come to life in your home!! Please look at all of the images here. These are all fairly simple things to do, you just need to look beyond what it is now, to see what it can be!! Go create! 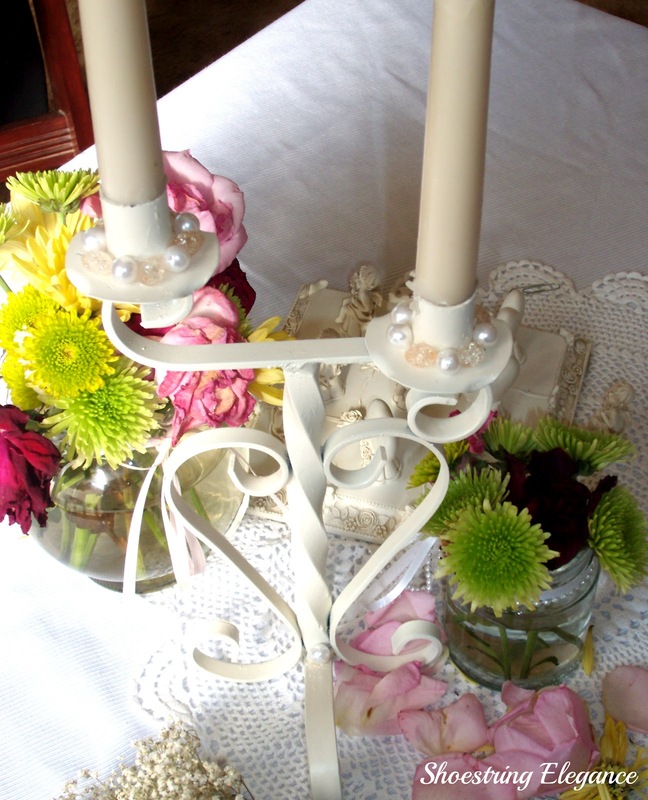 Enjoy Elegance on a Simple Budget! I couldn't afford roses for this piece, but I have always loved Baby’s Breath ( which is only $2.99 for a nice large bouquet)! What can you afford? Do you have an old piece that you could make your Masterpiece? If you do, have at it!! 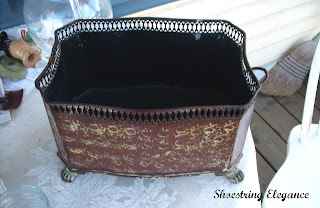 And please come back here or on Shoestring Elegance's facebook page and share it with me!! It is seeing others creations, that inspires me to look beyond a simple object to its glorious potential!! Have a wonderful weekend all! That is so pretty--love it! Thank you so much, Ladies!! I'n so pleased you like it and took the time to give me some Comment Love!! 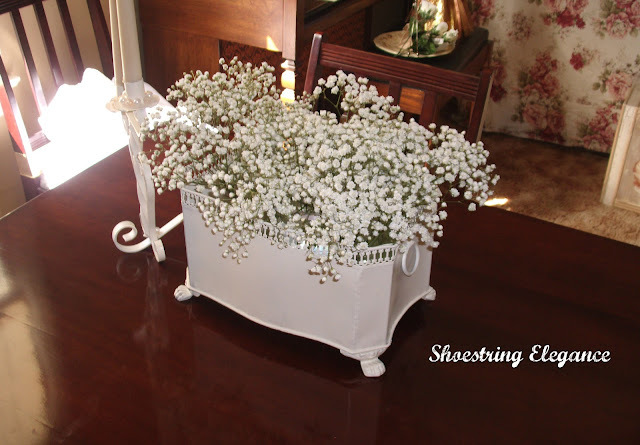 I love that piece painted antique white! And how clever to use baby's breath for a centerpiece--I've never thought of using it by itself, but it looks just beautiful! Thanks, Richella! I love the old look of just the Baby's Breath. When I was younger we use to make baby's breath rings to wear in our hair for fancy!! I'm dating myself a bit!! Thanks for the lovely comment! I love it! But I'm wondering if they have "fake" baby's breath that looks real. I kill everything I touch. Hey, Ally, Thanks so much for your lovely comment, they do make "fake" baby's breath, but it is a far cry from the real thing. I paid $2.99 for what you see in the picture and because they are in water they will last 1-1/2 - 2 weeks!! Best of luck! White paint is a miracle cure, isn't ?!!! Looks beautiful filled with baby's breath! I hope you'll come by and visit for the Knick of Time Tuesday Vintage Style Party. Thanks so much Angie!! Popping over!! Thanks Miss Susyq!! ans thanks for the follow and invitation!! boy oh boy am I glad I found your blog - I have a feeling after reading several posts that I might just be a tad more creative! hahaha. found ya from the blog hop and excited to be your newest follower! whoop whoop! Thanks for the follow!! Glad you popped over!! Best of Luck! Popping over to see what you've been up to! Beautiful center piece. I love it with baby's breath. It is so simple, yet so elegant. Stopping by from The Things We Find Inside. Love for you to return the follow when you can. I am hosting Mom's Monday Mingle now. Love for you to link up! Thanks so much, Dani & Diane!! I'll check out your blog, too!! 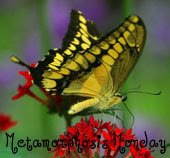 I love Inspire me Monday! 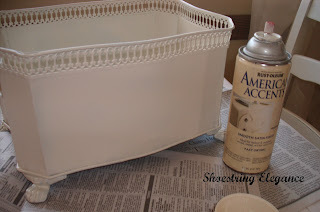 Such a lovely transformation from plain to elegant...and, all on a shoestring! Thanks so much, Carolynn! I'm so glad you like it! Yep!! Can't enjoy it, If I can't afford it! Many Blessing for a great week for you, as well. Thanks for sharing at Knick of Time Tuesday - I'll be featuring you next week and there will be an "I Was Featured" button waiting for you! By the way, please add a link back to the party within this post too. Thank you so much, Angie!! Super glad you liked it as much as I did!! Linked all up!! Wishing you a Great week with much appreciation!!! I have always loved baby's breath. Your arrangement is absolutely stunning! Thanks for sharing this creative idea on Simple & Sweet Fridays. It looks so pretty with the baby's breath in it. Beautiful project! Great job, I like the baby's breath in the arrangement. What a wonderful transformation! 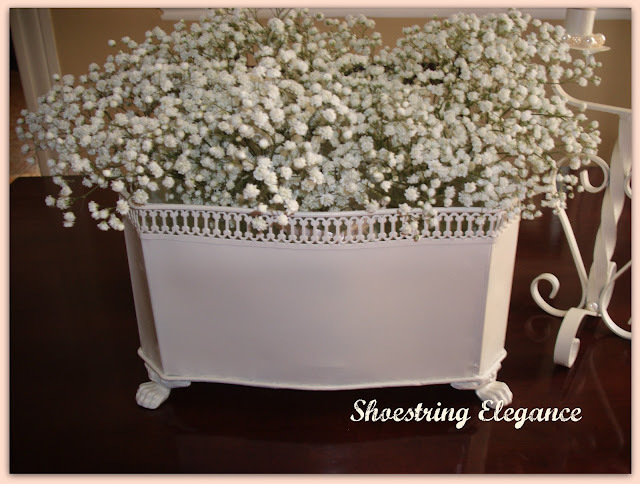 This container is gorgeous in white and love the baby breath's in it. I'm sure you're going to use this a lot. I will never look at those magazine racks the same way again! The metal lace makes such a beautiful statement. I also love the baby's breath inside, a very lovely piece! Thanks for sharing your creative inspiration with Sunday’s Best – you helped make the party a success! Cathy, I'm so thrilled you like it! It's amazing isn't it what a little tweeking to something can do? You words are too kind and very much appreciated! Hey, Heather thanks so much for coming by, I'm so glad you like it!! Yeah, I'm on the all shades of white kick, as well, as if you didn't notice! I love your re-make! Great job! Found you thru the I Love My Online Friends GFC Hop! New Follower! YAY! Hey, Tif! Thanks so much for your kind words! I'm a new follower now of your, too!! I love the coffee can hanging planter!! Genius! and Beautiful. Thanks so much, Marty!! That means alot to me. I hope you are enjoying a wonderful week!! Theresa, Congrats! 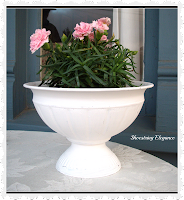 Just wanted you to know you've been featured on SImple & Sweet Fridays for this beautiful redo planter. Love the color and the baby's breath. Grab a button if you'd like and have a wonderful weekend! Thank you so much for the lovely comment!! 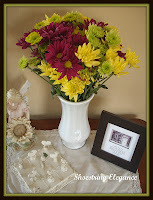 I am honored, that you would feature my little project on your Wonderful Blog!! I've happily and graciously posted your button!! This is so pretty and such a great idea. I have a link party on Wednesdays, and I would love it if you would link this and any other posts. It is called Wednesdays Adorned From Above Link Party. It runs from Wednesday to Sundays. Just to lovely for words Karen! The white on white is so elegant! By the way, this was the most viewed link at last weeks party! Stop by and pick up a I've Been Featured button! Kathe, Thank you so much for letting me know that, very exciting, glad people get a chance to see other ideas that don't cost a fortune. Thanks so much for the feature! 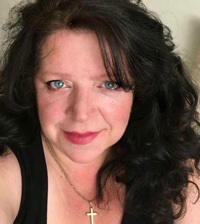 I am proudly wearing my I've been feature by Kathe with an E button!! Isn't it amazing what you can do with some paint and mason jars? Thanks for sharing on Tout It Tuesday. Hope to see you tomorrow! Stunning, stunning, stunning! It's amazing how beautifully the white paint highlights the intricacy of the metal lace! I loooove this centerpiece! Yes, it is, Pat! Thanks so much. Very nice! I like to use baby's breath in large vases. It makes a pretty statement, lasts a long time, and doesn't cost much.